Timelines have long been used as a visual representation of the bigger picture. They help our kids see where events have happened and how that fits in with other important people or moments in history. 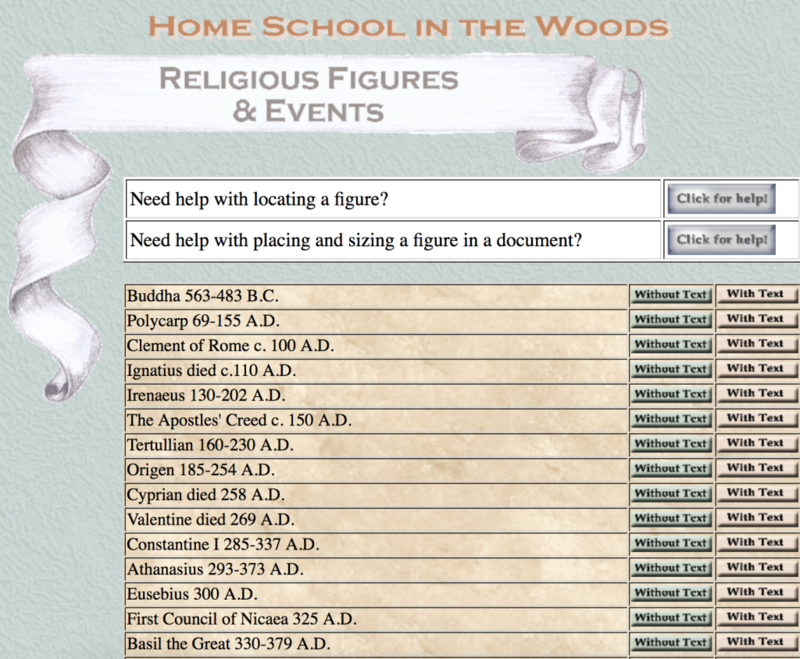 Back when we were kids we used to have our timeline filling one of our homeschool room walls and would spend a lot of time making and cutting our own figures as we studied history together. It is an incredibly effective way of putting the puzzle together. 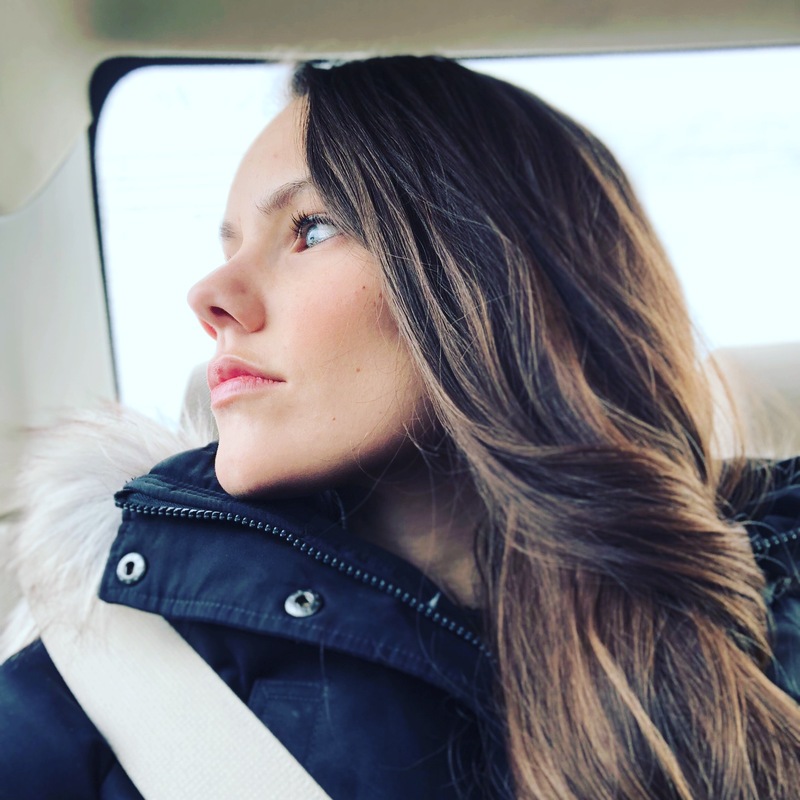 Education is often a very broad range of information, the real beauty comes when they can connect it all–and that is what a timeline does for us. Find out why you should be using a timeline if you aren’t already. Find out how easy they are to make and where to find timeline figures that are super easy to cut and place! This isn’t overwhelming at all, and I am going to show you why. 1. It helps your children visualize how history connects together. 2. The hands on aspect of cutting, coloring, and gluing helps children take an active role in that “fact” and aids in memory retention. 3. It helps children identify patterns that have occurred throughout human history. 4. It helps children see where people relate with, how they impact, or how they were impacted by the events during their time. 5. It is much easier to memorize dates and people when we can see it chronologically and it makes sense in our minds. Many of us are familiar with the wall timeline, but the reality is that simply doesn’t work for most people. The more figures we add, the more space we need and wall space is a hot commodity in most homeschool houses! 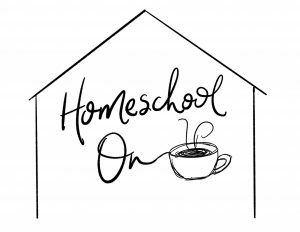 Many of us are dealing with small space homeschooling and don’t have a school room at all! Thankfully as homeschooling has evolved, so has the timeline! Notebook timelines, index card timelines, folder timelines, and box timelines are all viable options for people who want/need to conserve space and notebook your way through history (see examples of these options here)! 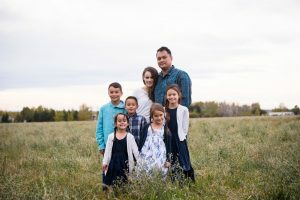 For me, I didn’t have the time, desire, or vision for making my own timeline and was searching for a ready-made option that would work for us. 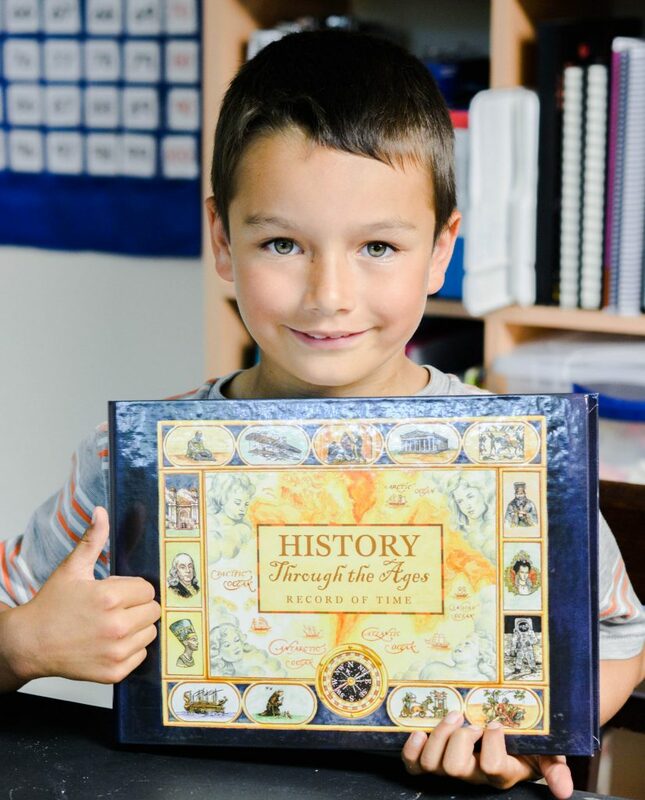 We decided to go with Home School in the Woods (also known as History through the Ages) as they had a beautiful Timeline notebook that we just fell in love with. Unless you are an artist and able to draw all your own figures, you are probably looking for timeline figures that you can use throughout the years. While I have found individual timelines on various blogs, I really needed something that was organized for me. I needed figures I could find by era with a simple click and print and thankfully, Home School in the Woods saved the day again! They have a number of products that help me make a timeline in about 30 seconds that is beautiful, self-contained, and high quality! Take a look at their complete History Through the Ages Timeline TRIO and let’s figure out exactly what that looks like. 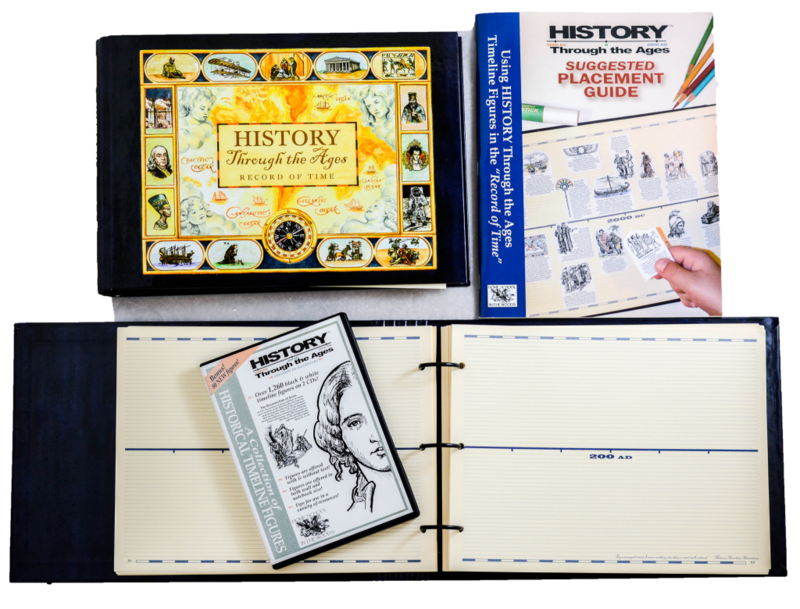 If you purchase the timeline trio, you will have everything you need to make your own timeline as you study history. 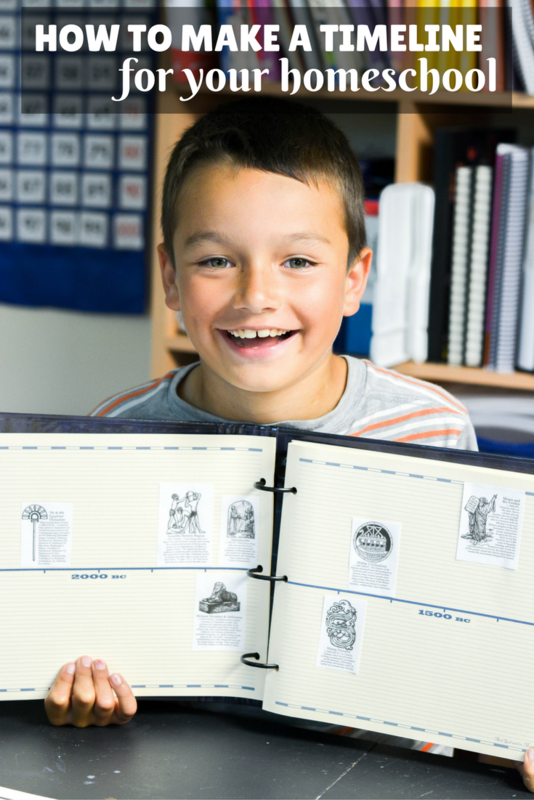 It doesn’t matter if you are using Home School in the Woods’ notebooking or hands on history curriculum, you can pair this timeline kit with ANY history program! The Record of Time notebook is filled with 122 pages of legal sized cardstock from 5000 BC to 2025 AD. This means that it holds up beautifully to glue or tape or whatever you are using to adhere your figures. It is printed on ivory paper which I love, it gives it an aged feel and yet the quality of this binder is unequalled in anything else I have seen, and it was ALL done for me (deep sigh of relief here!). There are faint background lines to help children place the figures as well as giving some guidance for making your own notations throughout. There is also a handy placement guide that shows you exactly where to place the figures so that they’ll all fit. I don’t know about you, but I have seriously had multiple occasions where we just stuck them on and then somehow didn’t have the space we needed for all the other figures that should fit as we got a little deeper into our studies. This guide is a HUGE help! The timeline figures CD has 2 discs included and has 1,260+ total figures, including 80 bonus figures! These figures are SUPER popular you guys–used by big name homeschool curriculum companies all over the world! They are available on sticky background paper but I actually prefer them on disc. Not only are they cheaper, but you can print off as many as you need for the kids in your family, or re-print them for different projects you might be using them for. For example, I might want to use my timeline figures for our timeline as well as notebooking projects that we are doing. Or maybe I want to print off some for a biography we are studying. The disc gives you that option and more! The figures can be printed for wall sized or notebook size. They can be printed with a description or without (for your older students that you might want to do their own notations). They are all black and white which gives you lots of options for coloring or even painting them with water colors! How easy are the figures to find and print? This was one of the main questions I had. If I am studying something, how easy is it to pop in this disc and find the exact figure that we are learning about? The answer is SUPER easy you guys! There are 2 discs included. 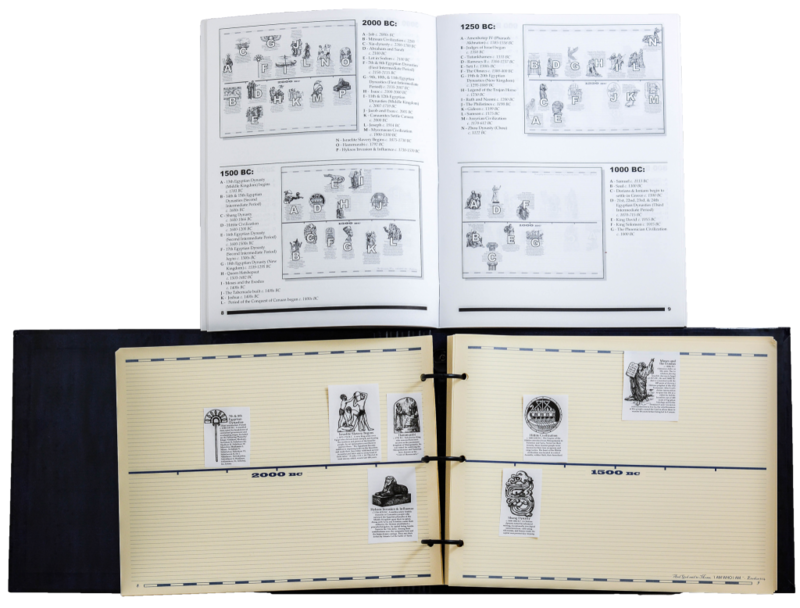 The first one has the figures on pages, they are optimum sized for notebooking (though you can print them larger for wall timelines as well) and come in groups based on the time period. Which is easy to navigate on the disc. Take a look at the layout of the first disc. The second disc is individual figures. You can size them to any size you want for your project, you can print them off much larger and it gives you total flexibility to use the figures as you need for your project. This includes not only historical figures, but all the Bible history figures as well, which I love! I love seeing how Biblical history relates to world history, how it all pieces together. Notice the easy help buttons at the top? These discs are SO easy to navigate you guys, and if you get stuck, there is lots of help! I didn’t even have to email the company, it is really well put together. The images are crisp and well done. The possibilities for these figures are literally ENDLESS and we are loving them! If you are falling in love with these resources and wondering how to get your hands on them, the answer is to go straight to the source. Home School in the Woods has put these all together for you and they even put them together in a package format with their Timeline Trio! You can grab your timeline resources by clicking HERE or on the image below! Here is the thing you guys, these resources are available in all digital download format (other than the binder, wouldn’t that be magical?!?!?) as well as physical format. There is a lot of flexibility to make this work for your family and this is a resource that trumps grade levels. You can use this with your grade 1 student along with your grade 11 student! 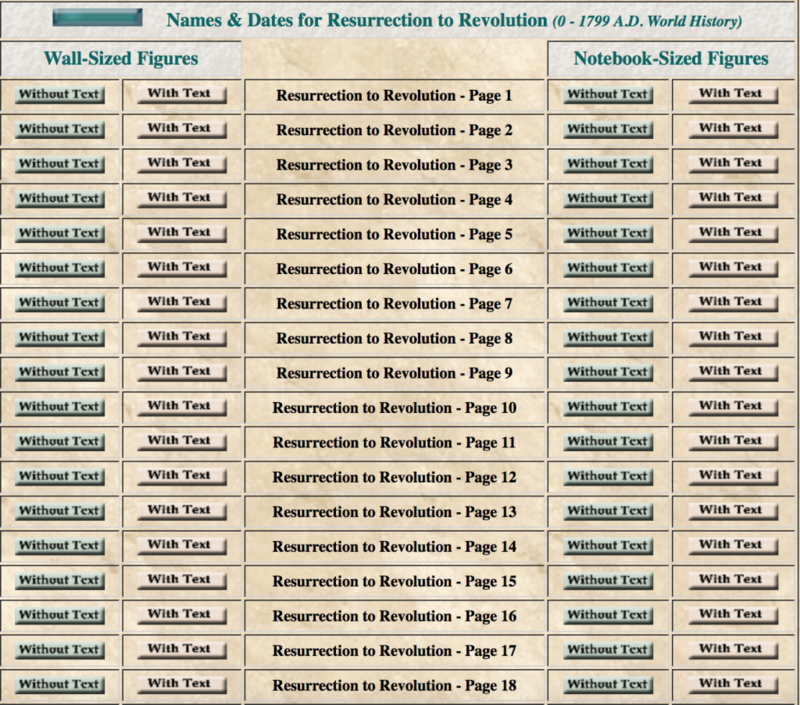 Anyone will benefit from making a timeline and utilizing these for either notebooking or hands on history. Head on over and check them out now! Find them on Facebook and Twitter. They are AWESOME and will answer any questions you might have! What do you think? Comment below and let’s get the conversation going! I love this idea! 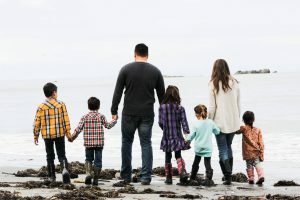 Would you recommend one timeline per family or one per child? Our family has a family timeline and each child has one. We did it this way so as the younger kiddos enter school, they will get the magic of putting people on their own timeline that they didn’t get to do while the older kids had learned.